Tell students that this is the second activity of their competition. The first group to complete the task wins five points. 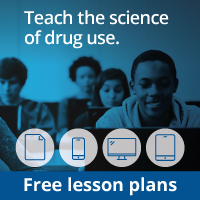 Students should use the “Nicotine and the Brain” and “Alcohol and the Brain” handouts from the lecture and the magazine content to help them complete this activity. Give each student a copy of the Puzzle Pieces handout. The definitions should be cut apart so each one is on a different piece of paper. The puzzle pieces are designed so that the definitions are gray and the words are white. The puzzle pieces include words and definitions from the module. Students will need to arrange the pieces so that the correct definition is next to each word. The team that completes this task correctly in the shortest time wins. Record the winning group’s points on the Group Scorecard. Ideas for making this activity more suitable for a bigger class: Each member of the team could complete the puzzle individually, and the team with the most correct puzzles in the predetermined amount of time could win the five points. Popular television shows and movies often depict underage drinking. It is important for teens to think critically about the media’s portrayal of alcohol use and recognize both the accuracies and inaccuracies. Divide the class into groups of 4 to 6 students. Give students about 10 minutes to list television shows and movies that portray underage drinking using the Media Report Card and assign each example an accuracy grade. Students should justify each grade in the comments section of the Media Report Card. Have each group present its two highest and lowest graded examples and explain the reasoning behind each grade assignment. How often is underage drinking depicted? What is the tone of the scene(s) in which underage drinking is depicted? For example, is the scene comic, designed to elicit laughs? Or does it take underage drinking more seriously? Are the consequences of underage drinking shown? How are the effects of alcohol on the brain and body depicted? *Adobe Flash player required to view.